Very helpful staff. Made my trip easier. Would recommend. Chill guesthouse quiet place for relaxing. The room basic but have everything you need as hot shower, comfortable bed and clean room. Breakfast included the price with many choice from menu. Location is good with many restaurants near by the guesthouse. Highly recommended for everyone! We arrived early in the morning, the staff help us drop off our bags at reception and check in earlier around 10:30am. We very happy because they help us everything we need as rent scooters to waterfall and tuktuk to airport with good price. Breakfast very good with juice evryday. Location perfect. Wonderful Staff so friendly & helpfully. Cheap private rooms , good location, very helpful staff - they are helping with organising everything, trip to waterfall (you must take it) and bus to our next destination. Would recommend. Good guesthouse and nice staff😁. We enjoyed so much for the time stay at Thavisouk. Ms Kim so friendly and smiling, she help us for everything as tuktuk to hospital and tuk tuk to the airport. The room is very nice and cleaned. Very nice private rooms and really cheap price & good breakfast including. Staff very nice and helpful. Would recommend this place. Cheap private double room included breakfast. We enjoyed our time at Thavisouk. Thanks Ms Kim. 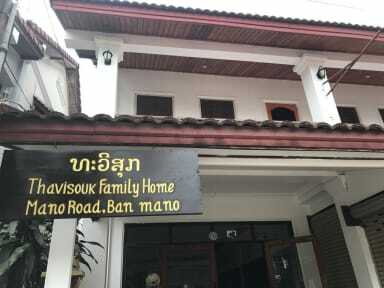 Thavisouk have good location very near the night market and Utopia Bar just walking 5-10 minuets. Room is basic but had everything you need as clean bed , hot shower and breakfast included. Staff so helpful and smile. Good place for staying. Great guesthouse with private room and private bathroom. The room very clean , quiet and comfortable bed. Staff so friendly and helpful. Breakfast good with choices from menu. Recommended for everybody!